If we ever needed an argument against using taxpayer money to bail out private companies who made bad decisions and are teetering on the brink of extinction, this is it. Less than one week after the U.S. government forked out $85 billion related to the American International Group (AIG) mess, the AIG executives took a little jaunt to a California spa and spent $440,000 on their stay. 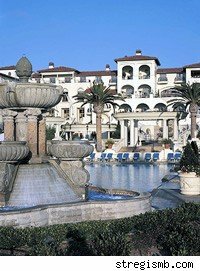 The executives stayed at the exclusive St. Regis Resort in Monarch Beach, and plunked down $139,000 for rooms, $147,000 for banquets, $23,380 spa services, plus other expenses for alcohol and entertainment. A normal two-night stay at the St. Regis with a "health and wellness" package costs $1,200. Quite the bargain, especially for a company begging for taxpayer handouts. Company representatives are defending the trip, saying that it was scheduled long before their bailout, and was done to reward successful independent agents who are bringing in revenue for the company. They say that AIG's top 5% to 10% are rewarded in this fashion, a common industry practice. Industry experts are saying that the lavish trip may have been necessary in order to retain good agents during this critical time. Plus the got a great deal! AIG only paid $1,600 a night for the Presidential Suite, which normally goes for $3,200 a night! Intellectually, I understand the need to give to the sales agents the things they've already earned. How else does a company keep its best sellers on board, especially during a company crisis? But as a taxpayer who sees the tab for all this bailout activity keep going up and up, I can't help but be miffed about this. How can money be spent on something this frivolous when companies are begging for taxpayers to save them?